This happened to me many times in my earlier days when I was a newbie internet bird, I just loved to browse new stuff but unfortunately I was not having internet connection at my home so I used to go to a cyber café to browse internet. But I faced that timer running problem that beeped as soon as my half an hour was done, so it was like a hell to me, because my ideas were big but pockets were small, so now when by GOD’s grace everything is OK I found this amazing trick that could help bypass the timer restriction in any cyber café where it is implemented. So the Process Explorer is that application that Suspend few running applications and can resume it instantly if you want too, so we will be using it to do this JOB. After you have downloaded the process explorer. Open it up on the cyber café system you are using. 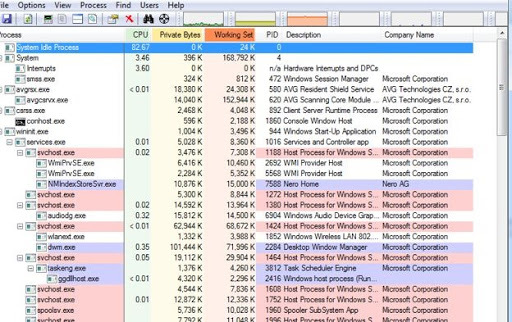 Now you need to search for two running processes “Client.exe” and “Guardit.exe”, as these two are responsible for running that timer. Now just right on both of them and chooseSuspend. This terminates the process and hence your timer will be stopped, and you can browse internet without restriction. After some good time surfing, if you wanna re-enable the timer, you can simply right click once again and choose Resume to start those process again, hence your timer will be started again.